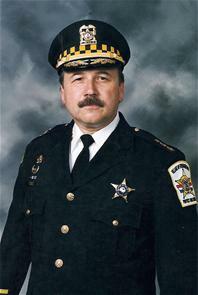 Having served the Village of Evergreen Park police department since 1976, in several capacities as a Patrol Officer, Tactical Officer, Detective, Sergeant, Patrol Watch Commander, Tactical Unit Commander, Lieutenant, Detective Unit Commander and as Police Chief since 2000. A graduate of the 178th session of the FBI National Academy and having served on several law enforcement Boards in leadership roles. It is been an honor and privilege to be a member of this agency and a resident in this community. Our agency is comprised of some of the finest people you will ever meet. Dedication to Public Safety and Excellence in Service and Performance is first and foremost in our mission. As the quality of life for the residents of Evergreen Park continues to improve, it demonstrates our effectiveness by what we do and the way we do it in step with the needs of all of the citizens and business members comprising our community. Thank you for your confidence and continued support in our on going efforts to be a positive representation of our Village as a professional law enforcement agency.